PATTAYA:--Soi Khao Talo residents want Pattaya to help catch 30-40 wild boars roaming the nearby woods eating trash and biting people. Residents of Eakmongkok 4/1 village met with Nong­prue Sub-district Councilman Metasit Samala Feb. 4, saying that construction workers living nearby originally had a couple boars as pets. But they bred to create a herd as large as 40 animals. Residents complained the wild pigs rummaged through trash bins and even bit a few people. They want Pattaya to catch the animals and restrict them to a pen where they can be cared for and not bother people. Wild boars, how similar the reports are. They behave very similar in German cities. Boar job 50 bht !! Get rid of them before they overun the city. Strange they don't complain about all the wild soi dogs doing the exact same things ? Send in the BIB for a pig on pig dust up. Will it be for eating or other pleasures ? Of course they are,same as dog ,cat,rat,snake,chicken,cow,sheep,rabbit,gerbils,crickets,ants,fish and vegetables. Lol ofcourse I forgot where I was for a sec. I know in NZ they eat wild boar but they eat natural vegetation, just wasnt sure if they ate rubish it would ruin the meat. 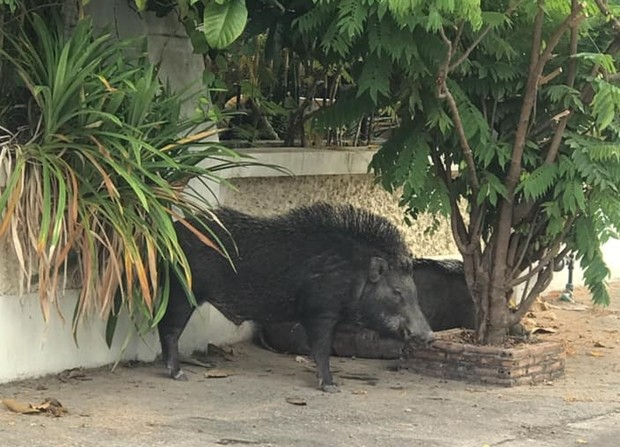 construction workers living nearby originally had a couple boars as pets. Just as puppies and kittens, the piglets are cute, but when they grow big they are kicked out on the street. To become stray boars. and belongs to know one, is just a farcical. a few hours all pigs would be dead, and in back of pick up.